An artist's illustration of the manned spacecraft for the Inspiration Mars mission to send two astronauts on a Mars flyby mission in 2021. 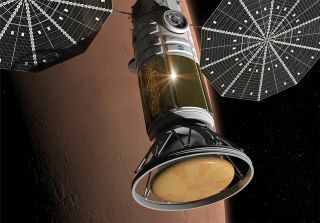 A private manned Mars flyby mission in 2021 could be an inspiring precursor to landing astronauts on the Red Planet's surface in the not-too-distant future, but much work needs to be accomplished before that goal can become a reality, experts told Congress Thursday (Feb. 27). The Inspiration Mars Foundation, led by the world's first space tourist Dennis Tito, aims to launch a pair of adventurous space explorers on a flyby of Mars in just seven years. That 2021 launch target takes advantage of a rare alignment that would allow the astronauts to fly by both Venus and Mars in a single trip. But to meet that window, Inspiration Mars needs NASA's help. You can also watch a video of Congress' Mars flyby 2021 hearing here. The hearing included testimony from several sources, including Scott Pace, director of the Space Policy Institute; Lester Lyles, an independent aerospace consultant; Doug Cooke, former NASA associate administrator for the Explorations Systems Mission Directorate; and Sandra Magnus, executive director of the American Institute of Aeronautics and Astronautics. While a Mars flyby might be possible in 2021, it will not happen without a clear budget and timeline, experts said. The space agency also needs to set forth their vision for other milestones that will help pave the way for a flyby, said Magnus, who is a former NASA astronaut. "In the context of a coherent strategy and framework, the appropriate missions will be defined logically, based on requirements developed within the strategic framework and then developed into a variety of mission and operational scenarios," Magnus said. "The Mars flyby thus can only be discussed in the context of that larger strategy and the associated missions and operational goals. "I would also like to underscore that any plan, whether its goals are to retrieve an asteroid, establish a lunar base or send people to Mars (or any combination thereof) is doomed to failure without the resources to support it — resources provided in a sustained and sustainable manner based on realistic projections," Magnus added. Magnus also spoke of national pride surrounding the space program, citing NASA's Apollo program, which landed its first astronaut on the moon in 1969, as an example. However, that program didn't prove to be sustainable. Instead of establishing future goals that extended beyond landing a person on the moon, NASA's budget dwindled in the 1970s. "Underlying that goal [to reach the moon] was neither a longer-term strategy nor vision — let alone political consensus — for how or what the U.S. should do in space," Magnus said. "It was a sprint to the moon for political purposes. And because of this, the U.S. space program has since suffered. Those who considered the lunar goal a means to a political end ultimately undermined the long-term interests of the U.S. space program — for once that goal was reached, attention was diverted elsewhere." "At a time when there is so much potential to make significant progress, I have never been more concerned about the future of human space exploration, primarily because of the current void in long-term direction," Cooke said. "Human space exploration is in dire need of a strategic plan consisting of logical objectives and goals, which are connected in sequence and in parallel, as appropriate, with tactically placed specific missions."